Long gone are the days when piercing any part of the ear besides the lobe was controversial. These days, multiple piercing sites along the ear are socially acceptable, and while certainly make a statement about the wearer, it's not a negative one. Whether you opt for a single stud at the top of the ear, a row of small hoops along the entire ear’s outer edge or a daring barbell threaded through two pierced holes at opposite ends of the upper ear cartilage, make sure you choose a piece of jewelry that looks good and is suitable for the area being pierced. Studs are the classic earring style and also one of the most versatile. A stud earring usually consists of a rhinestone, diamond or tiny charm attached to a small, thin metal post. The earring post is pushed through the pierced hole and held into place with a small backing that attaches to the post on the other side of the lobe or cartilage. Stud earrings are the most comfortable and can be worn anywhere along the outer ear cartilage. For a classic stud ear piercing with a modern, edgy twist, choose a smaller gauge size. The smaller the gauge, the thicker the post -- traditional studs, for example, are usually a 16 gauge, while a zero gauge makes a hole wide enough to slip a finger through. Captive ball rings are a popular choice for those wishing to pierce the flat piece of cartilage between the ear and side of the head. 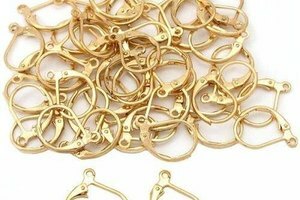 Captive ball rings are available in different gauge sizes, metals and colors, but their defining characteristic is the small metal ball that closes the ring and holds the earring in place. Captive ball rings can be uncomfortable when worn along the outer ear’s cartilage. Barbell earrings are metal rods held in place with two threaded balls, one on each end of the rod. Like other earrings, barbells come in different gauge sizes, colors and lengths. They can also be straight or curved. Barbells work with all cartilage piercings, especially those like the Industrial, which use two or more holes to complete the piercing style. Barbells can be uncomfortable when a phone is held against them or they're slept on. Thin, short barbells are the most comfortable of all the different barbell types. Tiny hoop earrings for cartilage piercings look just like their larger lobe counterparts, but are much smaller. Resembling little eye ringlets, cartilage hoops can be worn alone or alongside other small hoops. They are usually thin and comfortable to wear. Cuff earrings work best with Helix piercings, where the thin cartilage at the top of the outer ear is pierced. When worn, they form a tight clasp around the piece of cartilage, and the effect looks similar to the way a cuff bracelet closely hugs and wraps around the forearm. Ygoy: What are the Different Types of Cartilage Earrings?